VANCOUVER – Magna International is offering a solution to one of the main knocks against battery-electric vehicles – the time it takes to recharge on long trips. The Canadian auto-parts giant is shopping around a hydrogen fuel-cell platform as a range extender for battery EVs. It first revealed the fuel cell range-extended electric vehicle (FCREEV) in March at the Geneva auto show. The system was developed at the Magna Steyr Engineering facility in Graz, Austria, in partnership with fuel-cell developer Proton Motor of Germany and two Austrian research institutes, with funding from the Austrian government. The vehicle, converted from conventional range-extender hybrid minivan, can operate in different modes depending on the kind of driving, optimizing the system based on its state of charge. Combining the two sources of electric power allows the design to reduce the size and weight of the battery and the fuel-cell stack while offering both rapid battery recharging and hydrogen refuelling capabilities. 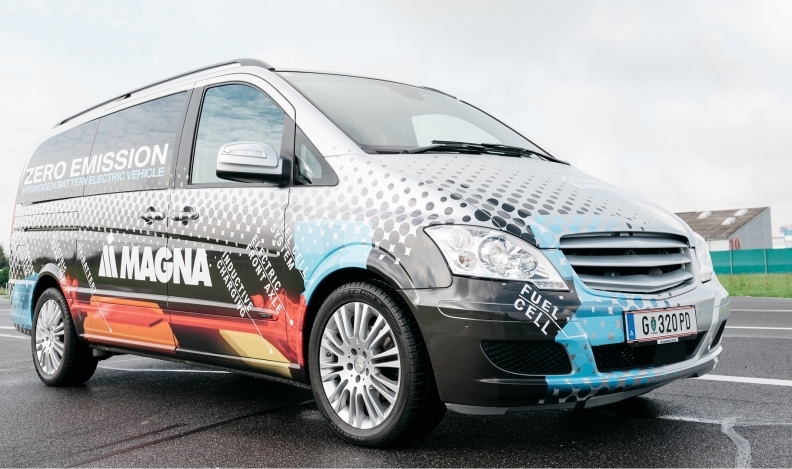 “We see from this approach that in terms of costs and performance we have key benefits for the end user,” Guido Bartlok, Magna Steyr’s hydrogen systems manager told the recent Hydrogen Fuel Cell Conference in Vancouver. Magna has developed fuel-cell components before, he said, but this was the first time it has integrated such a system into a vehicle. The fuel-cell range extender vehicle addresses the main criticism of battery EVs as long-range zero-emission vehicles. For example, Bartlok explained, a 700-kilometre drive between Vienna and Stuttgart, Germany normally takes about seven hours. Assuming fast-charging facilities are available en route, a battery EV would need up to 10.5 hours. But the all-wheel-drive FCREEV would add only 15 minutes to the journey if it needs one hydrogen refuelling stop, Bartlok said. If no refuelling facility is available, it could fall back on battery fast-charging. A smart human-machine interface would allow the driver to select different driving modes and energy-use options, from battery-only driving, eco mode that disengages four-wheel-drive and charge-safe mode that engages the fuel cell to recharge the battery and extend range using parameters such as vehicle performance and load on the HVAC system. Proton provided the fuel-cell stack while Magna supplied key components such as the battery, charging system, air compressor to feed the fuel cell, hydrogen tank and pressure regulator. Besides allowing for faster inter-city trips, the FCREEV could be used in other roles where long range and fast recharging are important, such as for taxi and shuttle services, Bartlok said. “We are just a contract manufacturer,” he said in an interview. “Our OEMs are our customers so we’ll offer this to our customers that we have the capability and the knowledge to do it."